Eagles’ Redemption in Limestone kicked off its grand opening last Saturday by offering six cents per bottle as opposed to five. 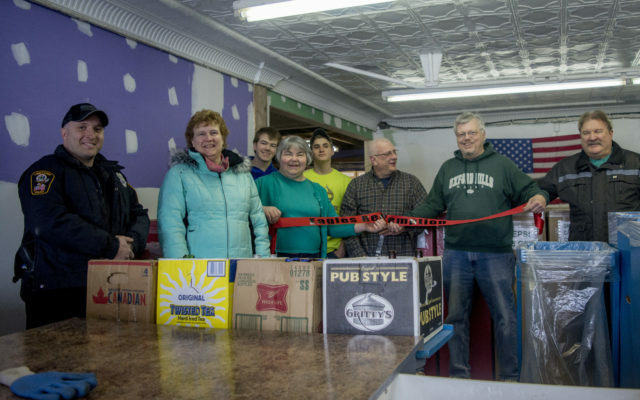 LIMESTONE, Maine — Eagles’ Redemption in Limestone kicked off its grand opening last Saturday by offering six cents per bottle as opposed to five. Local entrepreneurs Brian and Julie Weston own the business, located in the basement of their book and coffee shop, in the former masonic building on Main Street. The Westons purchased the store from Marilyne Ireland, who previously owned Friendly Redemption in Limestone. The couple said it was Ireland’s idea to offer six cents per bottle on special occasions. Frank Beil manages the redemption center while two high school students, Braydon Martin and Nate Labreck, each come in three days a week. Julie Weston said the store is closed on Sunday and open 9 a.m. to 5 p.m. Monday through Friday and 9 a.m. to 3 p.m. on Saturday. Brian Weston said he also is planning on doing bottle pick-ups at local businesses, such as Anderson’s Market in Stockholm. The Westons now own a coffee shop, bookstore, online Brodart book cover business, and a redemption center, but they don’t plan on stopping there. This summer, they’re going to open a laundromat in the basement next to the redemption center. Julie Weston said that while overseeing multiple businesses can be overwhelming, she and Brian are “rocking and rolling.” Both were optimistic about the redemption center and future laundromat business, and are confident in Beil’s abilities as a manager. Before managing Eagles’ Redemption, Beil trained with Ireland at the former redemption center to “get a feel for what the business was like.” He’s been working in the bottle business for about a month and a half now. 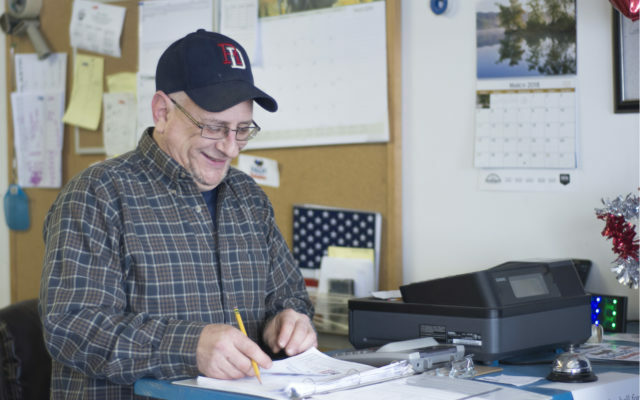 Beil already has acclimated to the daily responsibilities of managing a redemption center, which involve mentally juggling constantly changing numbers and ensuring that each vendor gets precisely the right amount of empty bottles during pick-up. Both Julie Weston and Beil pointed out that redemption centers are among the only businesses in which money is given to customers. Beil dealt with multiple customers while explaining his role within the business, and multi-tasked with ease. 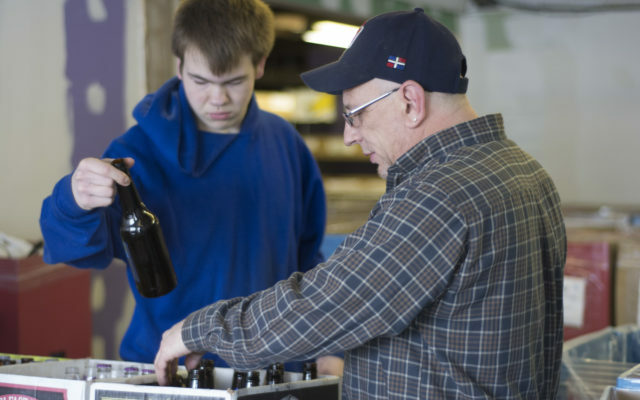 Martin, a Limestone resident attending 10th grade at Caribou High School, has been at the store since it opened at the start of the month and, like Beil, has quickly grown accustomed to the fast-paced work environment. Martin said he typically works on Mondays, Wednesdays, and Fridays while Labreck works on the other days. Labreck said he’s been at the redemption center just as long as Martin, and that in addition to helping with bottles, they both worked on painting and renovating the space. Limestone Economic Development Coordinator Dennis McCartney also attended the grand opening, and said he believes it’s a great opportunity for the town. “Any business that creates more activity on Main Street is good for Main street,” McCartney said. “It helps encourage other businesses to come to Limestone,” he said, adding that space is available on Main Street and that money is available for any entrepreneurs hoping to set up shop in Limestone. Among the many customers on Saturday, March 17, was Limestone resident Norman Sylvester, who believes Eagles’ Redemption will stay in the town for years to come. Like McCartney, Sylvester is glad to see a new business open in Limestone. 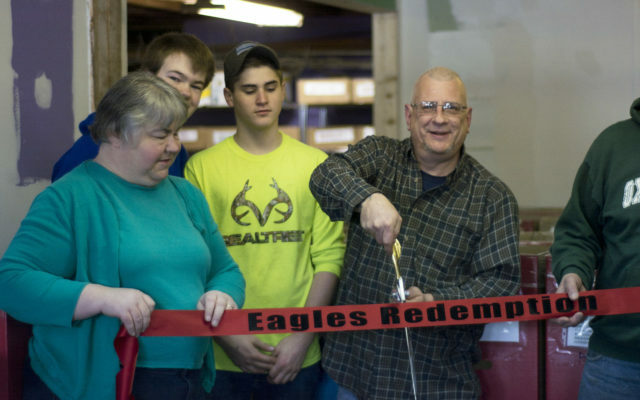 Eagles’ Redemption Manager Frank Beil prepares to cut the ceremonial ribbon on March 17 as business owner Julie Weston, from left, and employees Nate Labreck and Braydon Martin look on.